For nearly 30 years Main Course Catering has been customizing exquisite culinary experiences for private parties, corporate functions, wedding receptions and other social gatherings. As one of the Hudson Valley’s award-winning caterers, we’ve built our reputation on going above and beyond in providing excellent service. Inspired by the flavors and beauty of the Hudson Valley, our diverse menus and exceptional design services reflect each and every one of our clients unique tastes and styles. 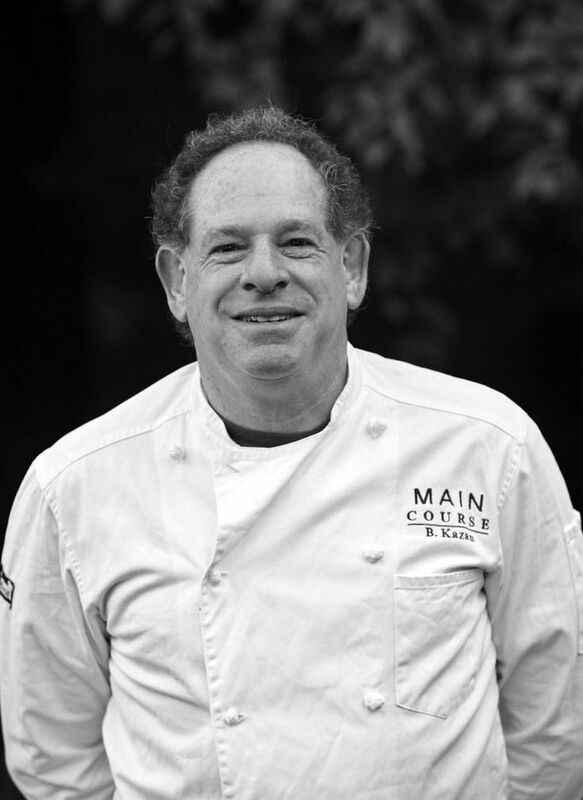 Whether your event is for a party of 10 or 1,000 people - our dedicated catering team led by renowned Chef/Owner Bruce Kazan, will create an unforgettable event experience for you and your guests. Voted “Best Caterer” by Hudson Valley Magazine since 1994, we will make your vision a reality. For over 50 years, Jenkins-Lueken has been providing the Hudson Valley with peaches, plums, berries, and over a dozen varieties of apples. The farm is operated by four generations of the Ferrante family, who offer sustainably grown seasonal produce, homemade breads and baked goods, fresh dairy products, and even plants and flowers from their on-site nursery and greenhouse. Edgwick Farm is a family owned and operated micro dairy and creamery. They raise their own goats from birth, with which they manufacture a variety of goat cheeses in small batches. Russell Farm is a family business founded in 1976. Their maple syrup, honey, and packaged mixes are featured in our Main Course Marketplace. Crown Maple has elevated maple syrup to a gourmet experience through state-of-the-art technology and a meticulously managed forest estate. Crown consults with sommeliers and chefs to achieve the ideal balance of flavors, aromas, and consistency in each bottling. Their goal is to educate and involve the community in the field of environmentally sound agricultural production without the use of harmful chemicals or preservatives. Feather Ridge Farm raises their own hens from chicks and provides them with an antibiotic and hormone-free feed and a free-range lifestyle. Dressel Farm is proud to be the largest strawberry producer in the Hudson Valley, and is known around the area not only for their strawberries, but also their cherries, raspberries, and, come fall, their apples. Campanelli’s is a small business that produces a variety of all-natural poultry products from chickens, turkeys, ducks, and geese in their own NY State inspected facility. All their birds are raised in clean, humanely designed open-air barns with no hormones, antibiotics, or steroids. Catsmo is an artisan fish smoking venture in the Catskill Mountains that uses only the highest quality, hand-selected, sustainably raised cold water fish. The fish is salt cured then and smoked in small batches daily over fruitwoods. The Hudson Valley Cattle Company represents and distributes meats from over a dozen small farms within the Hudson Valley. The farms represented by the HVCC adhere to the sustainable, free-range, and chemical-free practices of small, family-owned farms. ​Frank Sorbello founded Sorbello’s Farm in 1982. His crops include a variety of greens, from mesclun, baby spinach, and frisee, as well as microgreens. The greenhouses are hydroponic and the greens are all grown without chemicals or pesticides. Mountain View Farm is a CSA project located in Easthampton, Massachusetts. In addition to their CSA practices, they also offer pick-your-own fruits, veggies, and many fresh herbs and spices. In addition to being a working farm raising free-ranging cows, sheep, goats, turkeys, guinea fowl, chickens, and pigs, Sprout Creek is also a not-for-profit education center providing programs to help young people connect with the land and the seasons. Yes! Sign me up. No thanks. Please check your spam folder if you haven't heard from us within 24 hours.